Custom Concrete Solutions would like to take this opportunity to thank our builders for their continuous support and confidence in our work. If you are a builder please call for special pricing and new construction stages for your trades to follow as they enter a home prior to CCS. 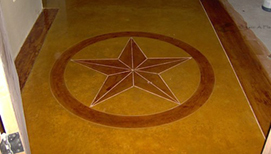 The final appearance of any stained floor project will be determined primarily by the quality of the concrete pour, the finish of the slab surface and the ongoing protection of that slab during construction. 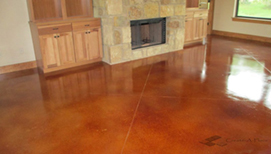 There are issues that will have an adverse impact in varying degrees, upon the quality of the finished stained floor. The builder should be responsible for relaying all of the information to the concrete contractor, the concrete finisher and all sub-contractors involved. Communication of these issues to all construction personnel is vital to the success of any staining project. CCS will provide the builder with all necessary materials needed in order to provide the customer with the decorative concrete floor they desire. 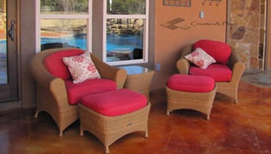 Custom Concrete Solutions recommends that you always use a professional installer for decorative concrete.